I always enjoy this time of year… (okay, okay, I’ll admit I’m still in Arizona but I’m wearing my “Alberta” hat right now) because spring means rodeo season is here. Canadian Pro Rodeo action technically kicked off last fall with the Saskatoon Indoor Pro Rodeo but the first ‘spring’ show ran in Camrose March 19-21 followed up by Lethbridge March 25-27. While it’s still pretty early to say who’s in solid shape in the overall standings, it’s always fun (and interesting) to see who handles the small indoor barrel runs well. And, no surprise, some of the names at the top of the CPRA roster so far are the same names we saw at this point last year. Right behind Lauren is another ‘soon-to-be-married’ barrel racer… the 2009 Reserve Canadian Champion Rana Walter. 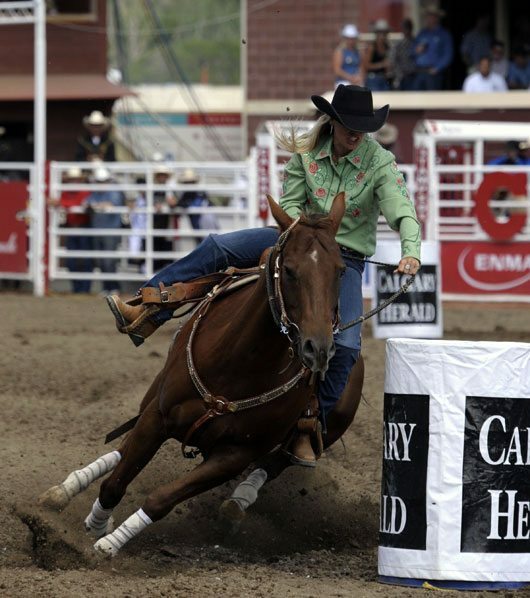 The Lethbridge cowgirl finished second at her hometown rodeo and third at Saskatoon last fall. No stranger to the world of barrel racing, Rana is a four time CFR qualifier. She rides Real Easy Doc (Easy Jet/Doc Bar bred). The long-strided gelding, trained and futuritied by Donnie Reese, won the first $100,000 Pro Tour Barrel Race in Oklahoma City as a three year old, then went on to earn the BFA Oklahoma City Juvenile Championship and Reserve BFA Derby title. Walter has since enjoyed additional Derby, Pro Rodeo and Fast Time wins aboard the big chestnut gelding. Also making an appearance in the early standings is Laura McPherson of Wolf Point, Montana. A relative newcomer to the Canadian Barrel Racing scene, due in part to the challenges of rodeoing from Wolf Point (a farming community located in the northeast corner of Montana many miles from almost anywhere), Laura won the Saskatoon Pro Rodeo last September and has plans to head back to Canada later this spring. “I first came up to Canada two years ago,” the Montana accountant explained. “There are some great rodeos up there and really nice people. I just live a long way from most rodeos, so I have to plan my trips carefully.” Laura runs a ten year old home-raised granddaughter of Dash For Cash. 2009 Canadian CFR qualifier and CPRA Barrel Racing Rookie of the Year, Adel Hansen is off to a good start too. The Okotoks cowgirl and UFA executive has three horses in her barn though for the indoor venues, she often runs her mare, Freddie. Adel used a similar strategy to Lauren Chad – she booked her horse into the Champion Equine Rehab and Training Centre at Carstairs, Alberta for a few weeks of spring conditioning prior to rodeo season. Adel sits fourth in the standings. The majority of the semi-pro associations are just getting underway with April rodeos scheduled. Check back later this month for early-season semi-pro highlights.